As some of you may know, around this time of year, there are several options to play a video of a roaring fireplace on your TV (or other screen) for Christmas. 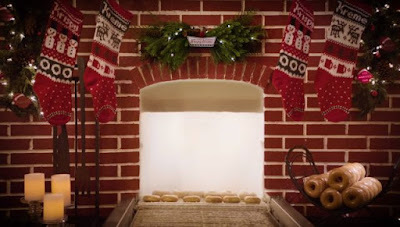 This year, Krispy Kreme offers their own take on the holiday fireplace video with the Happy Holiglazer. The Happy Holiglazer features two hours of Original Glazed Donuts (and other holiday items) rolling out (on a conveyor) from under a waterfall of glaze and out of a festive fireplace. The video come accompanied with instrumental Christmas music. You can find the video on the Krispy Kreme website here or check it out below.